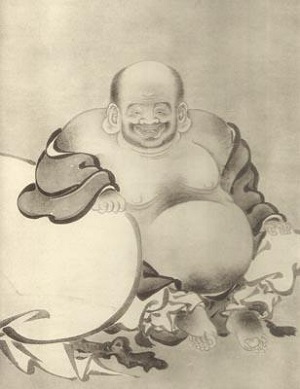 Hotei lived in the T'ang dynasty. He had no desire to call himself a Zen master or to gather many disciples about him. Instead he walked the streets with a big sack into which he would put gifts of candy, fruit, or doughnuts. These he would give to children who gathered around him in play. He established a kindergarten of the streets.